Trust Thailand to surprise you with the most unexpected. If you ever thought t was only Europe and the US that had vineyards, the Pb Valley Khaoyai Winery right in the middle of Thailand can be an absolutely delightful surprise! The entire avenue is lovely with lots of good food and drinks to look forward to. If you are traveling with someone who is below 18 years of age, they can enjoy the vibe of this place sipping on some grape juice. The professionally guided tours is a great way to view the lovely, adjoining avenues. There are farms featuring trees of mangoes, passion fruit, dragon fruit and more. In all, a great place to spend time away from the hustle and bustle of the city! Also, visit the popular attractions in the city by following Bangkok itinerary 7 days. 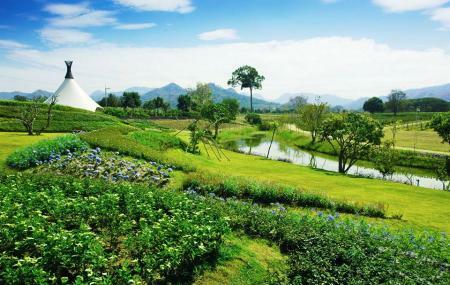 How popular is Pb Valley Khaoyai Winery? People normally club together Wat Thep Phithak Punnaram and Primo Piazza while planning their visit to Pb Valley Khaoyai Winery. I came here for a wine tour and tasting. Overall it was fine. The tour was okay and the wine was pretty good. As a part of our package, we got lunch and wine. We chose Thai food and it was mediocre. I think Thai food is best as street food. The view of the valley is fine. I quite like the sunflower field, although I didn't quite get too close to it. Very impressed. I've been here twice in two days and service/food has been consistent. The restaurant is well organised, lots of staff who are attentive to customers needs. The food is good both western and Thai dishes. Good wine by glass or bottle at reasonable prices. Highly recommend. Very beautiful place. Tour was fully booked when we reached but they allow you to explore the entire compound yourself free of charge. However the compound is massive and will maybe take up to 3hours to walk through the entire area. It can get very hot so please bring an umbrella or wear a cap The flower garden in full bloom looks great. The vineyards give the place a bit of an Italian vibe. The surrounding tall mountains also add a nice flair to the overall scenic view. Highly recommended.